I have started a new experiment to test my ageparser tool: I will try to determine the 'chronostratigraphic pulse' of the geoblogosphere which I intend to publish monthly. As a starting point I have created a geoblogosphere aggregator, which collects titles, urls etc from the RSS feed of as may geoblogs as possible, basically those blogs listed here in geoberg.de. Check it out.. new blogs can be entered by visitors themselves. The next step will be to add stratigraphic information which will be extracted automatically from the blog content. If you are interested how this works visit my agesearch toy.. 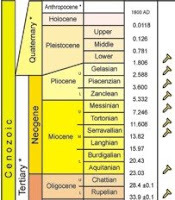 The Tertiary is gone since 2003 but the discussion on the stratigraphic classification of the Neogene is still ongoing. 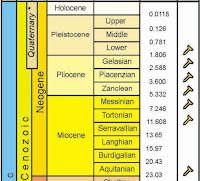 For example, the International Stratigraphic Commission decided to ban the Quaternary from the official time scale, but geologists have sucessfully fought to keep this system (see for example this document). 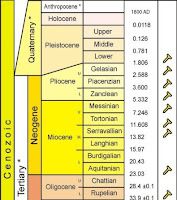 Both, Quaternary as well as Tertiary were regarded as 'remnants of the Neptunist concept of stratigraphy'. 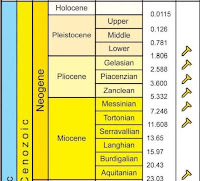 Strange, as recently, the 'Anthropocene' was proposed in 2007 by the Stratigraphic Commission of the Geological Society (UK) which also caused some blog echo for example here and here. 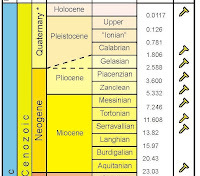 These 'outs' and' ins' are hard to follow, therefore the International Comission of Stratigraphy quite frequently provides updates on their stratigraphic chart at http://www.stratigraphy.org/cheu.pdf. 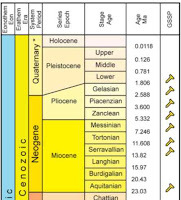 Every time I visit this page this 'standard chart' looks different and unfortunately the stratigraphy.org page does not archive older versions of the chart for comparison. Fortunately there is the Internet Archive which never forgets! 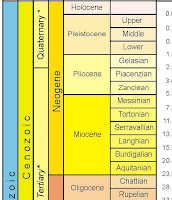 Just visit http://web.archive.org/web/*/http://www.stratigraphy.org/cheu.pdf and you can download older versions of the stratigraphic chart back to 2004: a 'sequence of stratigraphic charts'. December 2005: The Quaternary is back! looks strange, but it's there..
October 2006: The Tertiary is back! September 2007: Tertiary off again.. and a strange line from Quarternary to the base of Gelasian..
Footnote: The status of the Quarternary is not yet decided. Current version (Nov. 2008): Quaternary has two potential bases?